Jimmy “Superfly” Snuka, one of pro wrestling’s biggest stars of the ’80s and a WWE Hall Of Famer, has died. His daughter, who currently wrestles in WWE as Tamina Snuka, broke the news on Instagram yesterday. Snuka was 73 and had been suffering from dementia and stomach cancer. Born James Wiley Smith (he’d later legally change his last name to Snuka), he hailed from Fiji and left a career in bodybuilding to pursue wrestling in 1970. A naturally charismatic character with a chiseled physique, Snuka found success performing around America and Japan before debuting in WWE 1982. 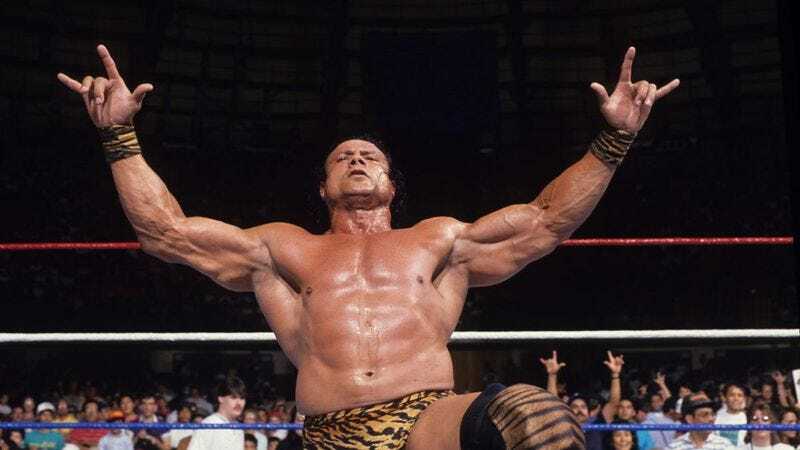 Snuka was famous for taking to the air at a time when wrestling was almost exclusively done on the mat, and despite his character initially being positioned as a villainous foreigner, his athleticism and acrobatics made him a fan favorite. Eventually, he’d become one of the company’s leading good guys, befriending Hulk Hogan and feuding with the likes of Captain Lou Albano and “Rowdy” Roddy Piper, the latter of which mocked Snuka’s heritage and smashed a coconut over his head during a legendary interview segment. The defining moment of Snuka’s career came in 1983. Snuka was embroiled in a battle with “Magnificent” Don Muraco, which led to a steel cage match for the WWE Intercontinental Championship on the company’s biggest stage: Madison Square Garden. Snuka lost the match, but dragged Muraco back into the ring before climbing to the top of the cage, giving his trademark “ILY” sign-language gesture, and leaping onto Muraco, who was lying 15 feet on the mat below. That move would inspire an entire generation of wrestling daredevils to risk life and limb for their craft. Snuka was inducted into the WWE Hall Of Fame in 1996. More recently, Snuka’s legal troubles overshadowed his wrestling career: His death comes little more than a week after a Pennsylvania judge dismissed a murder charge against him that stemmed from the 1983 death of his then girlfriend Nancy Argentino at a hotel in Allentown, PA. No charges were filed against Snuka at the time, but the case sprang back to life 30 years later after a 2013 report published by Allentown newspaper The Morning Call, in which Argentino’s autopsy results confirmed “the case should be investigated as a homicide.” In 2015, Snuka was arrested and charged with third-degree murder and involuntary manslaughter. His lawyers claimed he was mentally and physically unfit to stand trial—Snuka was also a plaintiff in one of the lingering concussion law suits filed by former wrestlers against WWE—and on January 3, 2017, the judge declared him incompetent to stand trial.